Compact, upscale and colorful kitchen for little chefs. Made in USA of US and imported parts: Some accessories and electronics made in China. Need more information on the cubic play space of the Little Baker's Kitchen? 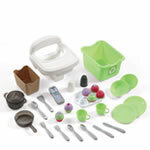 View our play kitchen infographic!